Ever experienced that awkward, momentary panic when your CEO fires a question your way that you can’t answer? It can make your stomach lurch. Your heart race. And your reputation wobble. Second-guessing your CEO’s questions isn’t easy. But I’d bet my bottom dollar that there’s one hot topic internal communicators will soon be cross-examined on: employee engagement. Done well, employee engagement can be the difference between company A being more successful than company B. A highly engaged, motivated workforce directly relates to improved productivity, performance and competitive advantage. And that’s why your C-suite will soon come calling. What systems do you have in place to measure employee engagement? What percentage of staff open, read and act upon internal communications? Which teams are less engaged than others? How do you communicate important messages that effect behavioural change? How can you tell if your messages are reaching the right people, at the right time? All internal communications professional know that employee engagement has its roots in good old-fashioned communication. But getting staff to actually take notice of your communication, no matter how beautifully crafted, is easier said than done. There’s a perfect storm building inside virtually every organization. Reasons include information overload; shortening attention span; an increasingly dispersed and diverse workforce who learn and communicate differently (across different devices); and the familiar problem of simply far too many emails! Unfortunately none of these - no matter how valid - will garner sympathy from your CEO. Instead you’ll be expected to have answers, not excuses. You’ll need to be one step ahead to counter these challenges. For example, is there a better way to bypass email, and get the right message in front of the right person, at the right time? 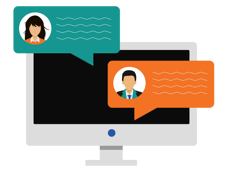 Say hello to specialist employee communications software. This clever suite of tools have been designed specifically to solve the universal challenge of getting employee attention. Important messages are ‘pushed’ directly onto employees’ screens, and the need for email is side-stepped completely. No wonder it’s emerged as the internal communicators’ knight in shining armour! Punchy, visual communication formats such as desktop alerts, screen savers and scrolling desktop news feeds, deliver a perfect yet polite ‘in your face’ message to employees. Furthermore, they allow organizations to track readership and interaction, and target those who need extra reminders (and let’s face it, every organization has those!). At a time when emails are no longer considered a reliable form of communication, many organizations with more than 500 staff are deploying this type of customisable, employee communications software. Not only for its effective message cut-through, consistency and control. But for the analytics and insights on offer. Now this is the part your CEO will love! For example, imagine being able to present management with a breakdown of total engagement results by department, location, channel, device and campaign message? Consider the value of identifying which areas of the business are better engaged, based on open rates, click throughs, page views and survey responses. Demonstrate to your C-Suite how digital validation tools reveal whether staff understand and comply with important areas, such as policy and compliance. Finally, it’s not a case of ‘if’, but ‘when’ your CEO asks you those tough questions about measuring employee engagement, with SnapComms employee communications software you’ll be able to respond with facts, figures and bags of confidence. Not a wobble in sight. High levels of employee engagement in an organization are linked to superior business performance, including increased profitability, productivity, employee retention, customer metrics and safety levels. Hence effective engagement communication is a key part of any internal communications strategy. Determined to help organizations improve cut through for employee communications, Sarah co-founded SnapComms in 2007. Within three years, SnapComms grew from zero to hero in the competitive sector of employee communication software, where it is now a global market leader.